The W2W goes from Barrow to either Whitby or Sunderland - splitting, much as my saddle did, just outside Barnard Castle. It's a more strenuous traverse than 'the' coast to coast, the C2C (Workington/Whitehaven to Newcastle/Sunderland). 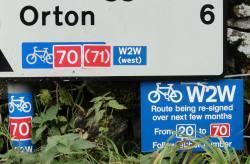 The W2W involves around 150 miles, vaulting over some lofty Pennine highlands, and probably three days. Day 1 was Barrow to Kendal, about 45 miles. Barrow is Britain's most working class place. This is based on metrics such as density of betting shops, fish and chip takeaways and tattoo parlours, in which case my home street in York must give it a run for its money. The scenery here is rolling south-of-Lakes hills and some flatlands (picture). At friendly Ulverston you can see a statue of Laurel and Hardy - Stan being a local boy - who weren't cyclists, but whose example of well-meaning but hilarious incompetence informs most of Britain's cycle infrastructure. Day 2 was Kendal to Barnard Castle, about 55 miles. 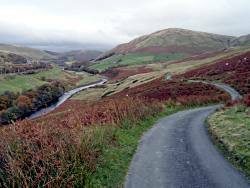 This was a tough day of headwinds (unusually: the prevailing direction is westerly) and sharp climbs, but also superb autumn scenery along the Lune Valley and the Howgills (picture) in shades varying from red to golden yellow to deep green, rather like my face. 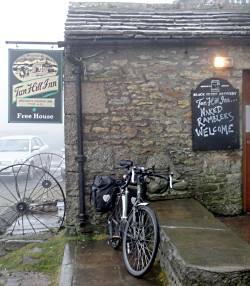 The climax of the day, and the route, is at Tan Hill Inn (picture), Britain's highest at 1732 feet (or, in metres, erm, quite a lot) up on a remote Pennine hill. On a clear day you can see both Irish and North Sea coasts. On a day like the one I was there, you can't even see both sides of the car park. It was drizzly, cold and misty, with zero visibility. I could just, however, make out the sign that said 'Naked Ramblers Welcome'. Day 3 was Barnard Castle to Sunderland, about 60 miles. Much easier in terms of hills - and with many miles of flat but spattery railtrail (picture) - this was still a trial thanks to the headwinds. 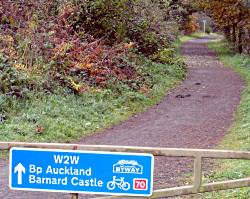 The worst challenge, though, was following the Sustrans signage into Durham (a convoluted route evidently modelled on the decay trail of a Higgs Boson) and out of it (I lost it completely, in every sense, especially when I realised I'd come in a circle back into the centre). So this sign was pretty appropriate (picture). The final riverside run in central Sunderland takes you past artworks representing the planets (picture), similar to York's Planets Trail, though obviously not as good, as this is not Yorkshire. 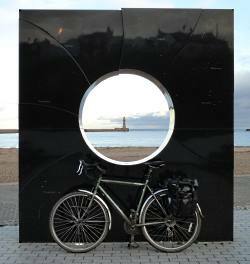 The grand finale is the ride out along Roker Pier (picture), and the commemorative picture of your bike at this fine monument. Then some commemorative drinks at Wetherspoon's waiting for your train home. Advice for the trip: it's rough in places, but nothing you can't enjoy; take your time; and you get best results if you drink plenty of fluids. Funnily enough, the same goes for the Wetherspoons. cycling and comedy duos eh? Great write up! I really enjoyed this post, I have been reading awhile now and really enjoy following your rides. I look forward to more updates, let's just hope the weather improves! 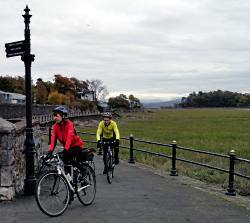 Morning, you'll be glad to know that your blog generated a few emails around Sustrans yesterday. As it happens I was in Durham seeing the County Council, and it turns out they and the University are planning a much simpler route through Durham City Centre. In practice this means that there won't be much improvement in signage over the next few months, but in the new year the route will be realigned across University land and hopefully by the time you next pass through Durham life will be a bit easier. Nah, seriously, the simplification of the Durham through route is good news, and thanks for letting us know. I was particularly pleased to see you'd put in 'west' and 'east' at some points - it's a bit of a bugbear with me when you regain a trail (having lost it or just detoured for refreshement or photostop) and have no clue which way you ought to be going! 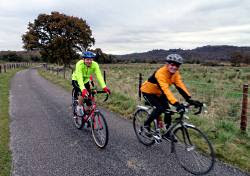 The W2W is a lovely route - three delightful, and challenging, days' cycling. It's thoroughly recommendable as the next-thing if you've completed the C2C. And great news re the Durham signage. 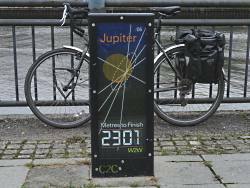 Now can you sort the Sustrans signs between St Ives and Huntingdon?